As police officers, our primary responsibility and duty is public safety; to ensure our city is a safe place to live, work, and raise a family. If someone calls for help and police are dispatched, we respond, without regard to who you are or where you are from. It makes no difference whether you are a soccer mom, an off-duty police officer, a CEO, or homeless; if you need our help, it is our responsibility to be there. We appreciate the words of support from Chief Outlaw and continue to look to her for operational guidance on important policing matters. It should be self-evident that a trained, experienced, police executive should be making important, day-to-day policing decisions for our communities and our organization. 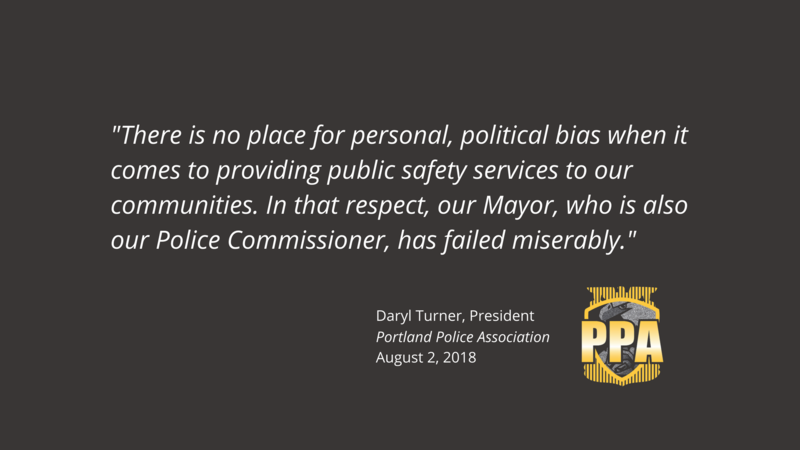 There is no place for personal, political bias when it comes to providing public safety services to our communities. In that respect, our Mayor, who is also our Police Commissioner, has failed miserably. As Mayor, Mr. Wheeler can certainly have his own personally held political beliefs. In contrast, as Police Commissioner, he must set his personal political beliefs aside and ensure public safety is his top priority. Politics have no place in the operations of the Portland Police Bureau. If Chief Outlaw’s review reveals flawed policy direction from the Mayor/Police Commissioner that includes selective enforcement of our laws, that is certainly problematic and cause for grave concern. Our Officers protect our communities and enforce the law irrespective of personal, political beliefs. Perhaps that is a lesson for the Police Commissioner.